clothes, your hair, or anything your choose. Practically weightless and otherwise invisible, Angel Tears will give any project an ethereal quality. 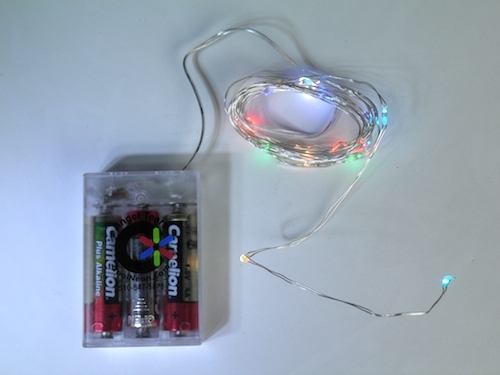 20 tiny LEDs are spaced every 4″ over a strand of wire more than 6 feet long. The battery door is pretty secure by itself, but for extra security, use the small phillips screw that comes with it (you’ll need a small phillips screwdriver).